I always learn something from my friend Monica. She learned to read and write in the last decade or so, when she moved to Kampala from her village in northern Uganda. But despite my college education, she has a lot to teach me. When I visited her shared compound on Saturday, she couldn’t wait to show me inside her house. I had to comply looking into the toothy ivory grin parting that smooth, ebony face. And when I entered, I understood why. First, I should tell you about Monica’s last house I visited, a single room from which she was still as heartily delighted and grateful to host my family of six. A sheet sagged from its string across the room as a divider between one set of bunk beds (where three grown women and Monica’s little girl slept) and their living space. Their few belongings were stacked strategically beneath the beds and around the perimeter of the room. Her hand-grinder, for the peanut butter she made to survive, took up its own space; it was a prized possession, purchased with money raised by a youth group in Canada. She didn’t have running water, of course; she didn’t have a bathroom, save the neighborhood pit latrine. But we still laughed washing up after dinner. One of us held the large plastic jug of water in a steady stream, and the other sudsed the dishes. My kids ran around with the neighborhood kids and a number of cheeky, waddling ducks. But Monica’s new home, where she fosters various rescued street children for a local NGO, is clearly a bubbling little spring of joy for her. After years of cleaning larger homes, Monica has—wait for it—two bathrooms inside a modest, concrete, six-room house! She even cooks inside the house. The floors remain unfinished, the whole thing could use a paint job, and I believe she had six pieces of furniture, counting the four beds. But as we stood in her living room with its two unvarnished benches and modest television stand, her delight was infectious. “I never thought I would have a house like this!” she gushed. She lives in poverty, but I always get something precious from Monica. And not just the brimming bag full of cucumbers, spring onions, and lemons she packed me from her garden. See, Monica is rich. I realize some of you will struggle with guilt as you read this—but that’s honestly not my goal. If this motivates you to generosity, please have at it! Yet I tell you this to illustrate two pearls that Africa has folded into my hands with her own mahogany-colored ones: the gift—the sheer joy—of simplicity, perhaps with a side of global (―even historical―) perspective. This month, as we pray for our homes, I hope to share with you Monica’s jewel: A form of fasting for our homes. It’s the gift of freedom from possessions as we trim them relentlessly. It’s not unlike the gift of, say, work, I’d guess. It’s the one that none of us wants to do, but that once we realize it for its rugged, beautiful weight, can’t wait to hand down to our own children. I will never come anywhere close to the muscularity of this culture in its impressive ability to survive—with joy—on so little. But living with less here has left my heart more lean and sinewy. It slowly cuts away at the fat I’d brought with me: Let us throw off everything that hinders, and the sin that so easily entangles (Hebrews 12:1). Let’s pray with and for each other that we can respond to God as He simplifies our earthly treasures. Thanks for sharing. This is something I am working on but sometimes it is hard. I have so much unnecessary stuff in our home that I just want to scream and start tossing most of it in a dumpster! This house needs to fast ! This makes me smile, Kathleen; I’ve felt this so many times! Godspeed in your house fast :). Trust me, it feels GREAT when you’re done! doing this myself…trying to downsize while in my 50s rather than waiting to do it when I’m in my 80s like my parents did…and then it was too difficult! I love the perspective this brings as we walk into stores and want anything new….is it really necessary ???? In my own life I need to stop justifying my “wants” and look up at the kingdom instead. After five years in Africa, I still struggle with those questions, Sharline! May God give us both wisdom in this “fast” for our families. Thank you so much for the prospective your words brought to my heart. I need to rethink what joy truly is and be oh so careful as I demonstrate it before my family. You and me both, Sarah Cate! So glad it’s helpful to you as it is to me. 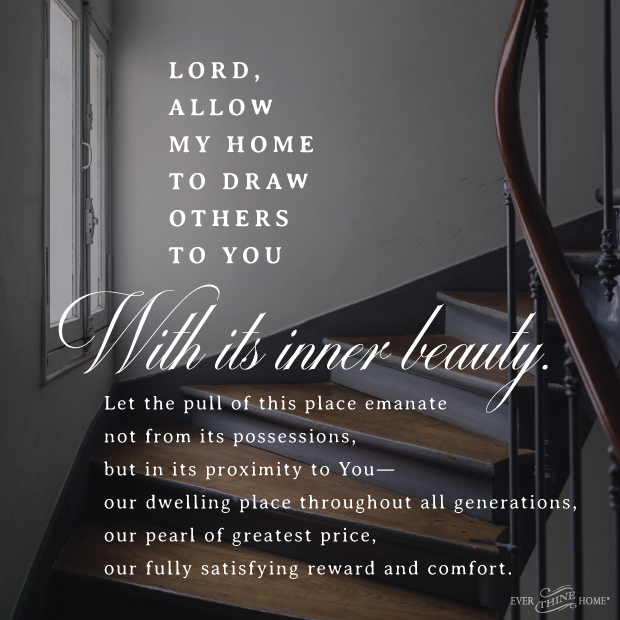 How true that we all could trim down our belongings so there is more space for Jesus and his things to reside in our homes. What a beautiful way of stating it, Denise. I couldn’t agree more. I really loved the story about Monica. I love simplicity and I just keep praying that one day my family will too. Thanks for sharing. She is beautiful inside and out–and I’m so glad she encourages you as she does me. Thanks for the warm words, Rhonda.